The African sharptooth catfish, Clarias gariepnus, is a dominant freshwater fish that occurs throughout Africa, and is an esteemed angling and food fishing amongst the local people. 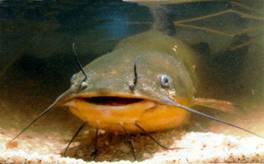 Catfish play an important role in the food chain, and are themselves a favourite food item of the Nile crocodile, marabou stork and fish eagle. Their growth rate depends on food availability and water temperature, and can be extremely rapid. The lifespan of an african sharptooth catfish is estimated at around 8 to 10 years. Recently there has been a surge of interest and investment in farming this species due to the excellent advantages offered by this hardy, fast growing species. In terms of quantities of catfish produced in South Africa in previous years amounted to some 240 tons in 2002. Today there are commercial catfish operations producing good members of fish from high-tech intensive re-circulating systems to supply the export market. A large export market is believed to exist in Europe and the Far East for producers able to produce the sustainable volumes required entering this market.